When my son was a baby I met Li-Anh. She has a little girl, L, who is just Connor's age. L and Connor soon became fast friends. Li-Anh happens to be a fantastic cook, and she would prepare the most elaborate snacks for our beach picnics or play dates at the park. There were rainbows of baby-size diced bell peppers, strawberries, grapes, beans, tomatoes, cherries, and apples. There were noodles cooked in a savory, homemade broth. 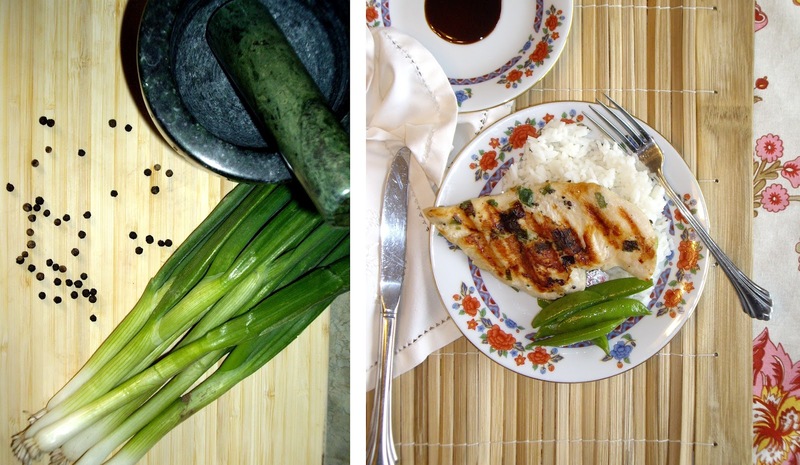 And there were tiny cubes of grilled chicken, which tasted of smokey green onion, fragrant black pepper (though not at all spicy as Li-Anh carefully scraped off all the large bits of peppercorn before she cut it up for the kids), and some mysterious ingredient which I couldn't place. I watched in amazement as my one-year-old, who normally shunned meat of any sort, ate the chicken like it was candy. I knew I had to get the recipe. Li-Anh smiled coyly as I tried to guess that secret ingredient; the one which made her chicken so delicious. It's fish sauce. She told me, amused. 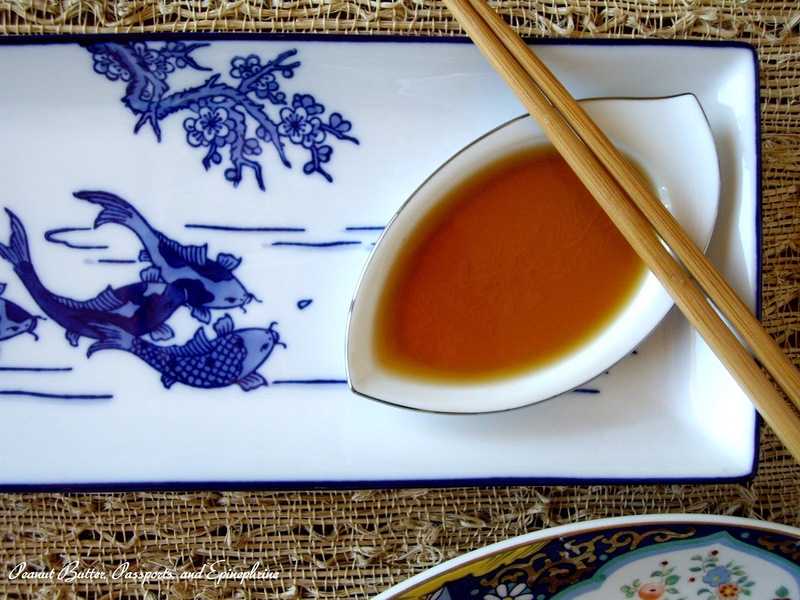 Have you ever cooked with fish sauce? I admitted I hadn't so she began telling me about it . . . When you're choosing a fish sauce, buy an authentic one from an Asian Market. The best come from Phu Quoc, a large island off the coast of Vietnam in the Gulf of Thailand. Look for one that's the colour of brewed tea - a clear, warm, coppery-brown. It's made with three parts Anchovies (or other small fish) to one part salt which are fermented in a large vat. As the juices from the fish are released they are mixed back into the vat day after day for an entire year. The result is an amazingly pungent, salty, brew that has a meaty, robust taste with a sweet finish, but smells like fermented gym socks. You spill it on your counter, you scour the counter. You spill it in your car, you buy a new car, Li-Anh warned. Surprisingly, fish sauce is not limited to Southeast Asia. In fact, the Romans brewed a similar sauce called Garum, and even now regions off the Amalfi Coast in Italy are still producing a fermented fish sauce called Colatura di Alici which is paired with pasta. 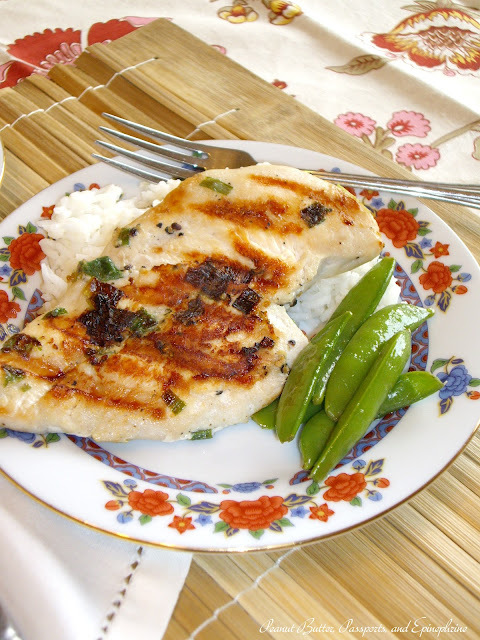 This chicken is so versatile. I grill up a big batch and use it throughout the week in wraps and salads, over rice or in my Chicken Divan. And Li-Anh makes a marvelous pizza with her grilled chicken. Butterfly each chicken breast and place in a large ziplock bag. Using a mortar and pestle, grind the peppercorns until broken but coarse, leaving some pieces fairly large. Add the chopped onions to the peppercorns and muddle the two together until the onions begin to release their juice. Scrape the mixture into the ziplock bag with the chicken. Add the fish sauce, oil, and sugar to the chicken. Seal the bag and toss and squish until the chicken is well coated. Refrigerate at least 4 hours (at this point the chicken can also be frozen in the marinade until ready to use). Grill the chicken over medium-high heat until cooked through. Chicken can be served warm, but it is especially good cold tossed in salads, in wraps, or simply by itself. My hubby and I love Viet food and you made it look easy! I'd love to have you link up that Thursday Food Fest. I'm at http://www.theeaseoffreeze.com. I open Wed at 7. Hope to see you next week. Thanks, Sarah. 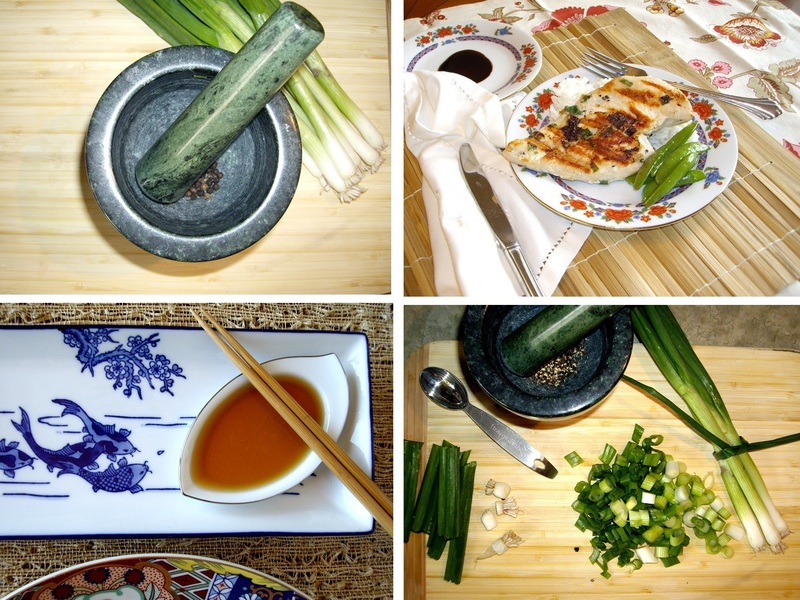 We love Vietnamese food, too, but with a peanut allergy we can't get it out anymore. Thanks for the invite to Thursday Food Fest. I'll be sure to check it out next week. Great post - will have to try chicken like this. I found this via Simple Living with Diane Balch. I linked in a salad I made using leftover lamb. Cheers. Thanks, Carole! I love lamb, so I'll definitely take a look at your recipe. I get quite a bit of spam comments, and the word verification helps cut the amount significantly, but thanks for the heads up. Thanks for the link, Diane. I pinned it. Can't wait to try some of your recipes! This chicken looks amazing! I have all the ingredients on hand and have pinned it so I can make it later this week. Thanks for pinning it, Alea! Judy - Where do you get Red Boat Fish Sauce? I have a hard time finding good fish sauce locally.